Everyone loves predictions this time of year, don’t they? Well, if they have to do with craft beer, maybe people really love them. As craft beer continues its upward trajectory in the U.S., it’s fun for professional beer lovers like myself to do a little prognosticating on the topic as we ease into the New Year. 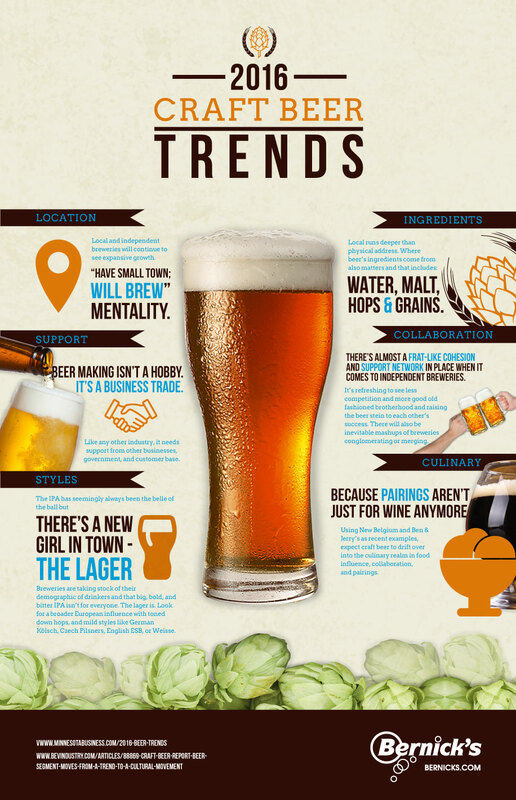 Here is my take on the craft beer trends and some of the major highlights I foresee. As breweries continue to pop up seemingly everywhere like the days of old, the brewers behind the beer wouldn’t be breaking ground without the support of their communities and the people who drink the beer. That’s the bottom line. The craft brewery trend is more like a movement. Movements require support and people, and on a continuous basis. If you ask any of the people behind independent craft breweries what their favorite aspect of brewing is, it’s likely serving. Depending on localism is also important to craft beer, and it’s not rare to visit a taproom and rave about the ambiance. Dig a little deeper into the bar tops, tables, and corrugated steel that flanks the walls, and you’ll likely be met with a story of procurement, and where breweries locally find their furnishings, flare, and ephemera. It takes a village! Have you ever wondered why craft breweries feature chalkboards of beer styles for patrons? Because their offerings vary sometimes by day, and chalk is easy to erase or add to. Today’s independent breweries are dynamic, and that’s a big part of why they keep their brands engaging. Gone are the days of featuring four standard styles; today’s draught selections feature a steady influx of creative ingredients and styles. Barrel-aged beers, sours, and more session-style brews will continue to forge a path this year … but not too far off the beaten path. Consumers have their preferences and while I welcome the bevy of new craft beer varieties, rest assured your beloved IPA isn’t going anywhere. The only thing better than drinking craft beer is sharing it with someone who possesses the same passion as you do. This practice extends to the other side of the bar, too, as independent breweries team up to create an even better drinking experience for their consumers. Collaboration will be the new black in the craft beer industry, a concept that will take place outside the taproom, too. Where the ingredients for beer comes from, to how the water is sourced all take team efforts. Remember the Insight Brewing Company feature Dean wrote a few months ago – the guys there searched and searched for real estate in Minneapolis specifically to source that city’s water into their recipes. Everything that goes into beer matters. I love when breweries release beer as a combined effort, and one of my favorite’s of last year was Summit Brewing Company and Bent Paddle Brewing Company in Duluth’s “Proud Mayor”, a dry-hopped Belgian-style ale. That beer was the result of In Cahoots, a collaboration of craft brewing right here in Minnesota that united 10 local breweries, split them into five teams, who collectively produced five new beers, as unique as the brewery pairings themselves! I know I always say this, but the best time to be a craft beer fan is right now. And, everything about the industry keeps getting better. Stay connected to Bernick’s as we continue to show our passion for craft beer in as many unique ways as we can.